Are there volcanoes in New Mexico? Is Mt. Taylor a volcano? Are the Jemez Mountains a remnant of a volcanic eruption? Is Kilbourne Hole a volcano? Are the Albuquerque volcanoes going to erupt again? How can you determine the age of eruptions? How old is the Grants lava flow? How old are the Carrizozo lava flows? Does faulting cause volcanoes to erupt? How do you know when a volcano is going to erupt? When will a volcano erupt in New Mexico? How do volcanoes affect climate? Although there are currently no active volcanoes in New Mexico, many extinct volcanoes are preserved in the state. Well known extinct volcanoes in New Mexico include Mount Taylor, the Jemez Mountains, the Albuquerque volcanoes, and Capulin volcano. Lava flows near Grants and Carrizozo are the youngest volcanic flows in the state (about 3000 years old and 5000 years old, respectively). Shiprock is usually referred to as a special volcanic landform called a volcanic neck, which is the solidified feeder system of a volcano. Steve Semken suggests that lava that makes up Shiprock interacted explosively with groundwater, forming a diatreme. A diatreme is a carrot-shaped volcanic vent that forms when hot magma comes in contact with cold groundwater. The broken up, fractured rock in the vent can sometimes be intruded by younger magma, causing the diatreme to be more well indurated (harder) than the surrounding rock. In the case of Shiprock, erosion has removed the soft sedimentary rocks around the hardened diatreme, creating the distinctive landform that we see today. Yes, Mount Taylor is a type of volcano called a stratovolcano. This type of volcano grows slowly and is formed by repeated eruptions, some explosive, and some passively forming lava flows. Between eruptions, erosion and sedimentation occurs. Lava flows are interbedded with volcaniclastic sediment (sediment related to erosion of the cone) and rhyolitic ash flow tuffs and pumice. Pyroclastic material (tuff and pumice) makes up about 10% of the cone. The volcano was active >3 to 1.5 million years ago. An east-facing amphitheater is a prominent feature in the central part of the volcano; Mount Taylor Peak, the highest point on the cone, is on the west rim of the amphitheater. Underlying Cretaceous sedimentary rocks and the oldest volcanic rocks in the cone are exposed in the lower elevations of the amphitheater. Crumpler (1982) suggested that the east side of Mount Taylor collapsed about 2.5 million years ago, leading to an lateral eruption like the 1980 eruption of Mount St. Helens in Washington state. No clear debris avalanche or volcanic deposits indicative of a lateral eruption have been found on Mount Taylor (Perry et al., 1990). Perry et al. (1990) propose that the amphitheater is the result of erosional enlargement of a crater on Mount Taylor volcano. Rhyolite (70 to 75% silica) was erupted during the early history of the volcano, followed by quartz latite (63 to 70 % silica), and finally latite (58-63% silica). Although, in general the composition of the lavas were more mafic through time, basalt eruptions occurred through the lifetime of the volcano. Most of the cone formed between 3 and 2.6 Ma and quartz latite makes up more than 65 % of the cone. Most of the basalt eruptions occurred around the periphery of the Mount Taylor cone. 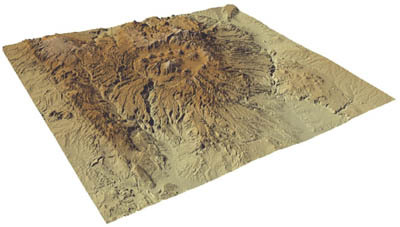 Basalt makes up ~80% of the Mount Taylor volcanic field, which includes Mount Taylor volcano, Mesa Chivato to the northeast of the cone, and Grants Ridge southwest of the cone. A long history of volcanism is recorded in the Jemez Mountains. 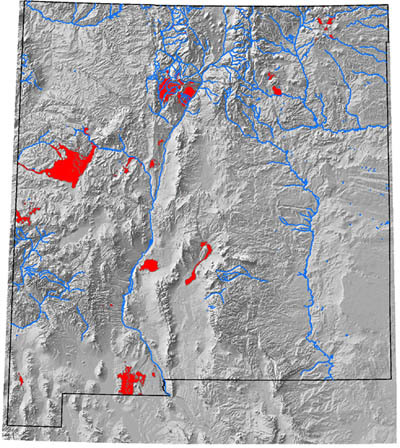 Basalt dikes, plugs, and flows that are 18 to 25 million years old are found in the southeastern and northwestern Jemez Mountains. Volcanism in the Jemez Mountains began in ernest about 10 to 15 million years ago with the eruption of basalts, followed by the eruption of basalt, andesite, dacite, and rhyolite between 9 to 3 million years ago, and rhyolites at about 2 million years ago. Volcanic rocks were erupted from dozens of vents across the Jemez Mountains, leading to the deposition of a thick pile of lava flows. About 1.8 million years ago, a small volume of rhyolite magma erupted explosively, forming the San Diego Canyon Tuff in the southwestern Jemez Mountains. This small eruption was followed by two very large explosive eruptions 1.6 and 1.2 million years ago that formed two thick ashflow deposits (Otowi Member of the Bandelier Tuff and Tshirege Member of the Bandelier Tuff) on the flanks of the mountain range. Each of the two eruptions that formed the Bandelier Tuff was volumetrically more than 250 times larger than the 1980 Mount St. Helens eruption . The initial stages of each Bandelier eruption produced ash that rained out of the sky over most of New Mexico. Following the initial ash-fall part of the eruption, activity shifted to a pyroclastic-flow eruption. This stage produced a fast-moving, extremely hot, cloud of ash, pumice, and gas traveling as much as 30 km from the central vent. The pyroclastic flow, which would have destroyed anything standing in its path, then solidified into volcanic rock known as tuff. Ash from the most recent Bandelier Tuff eruption (1.2 million years ago) has been traced eastward into Oklahoma, Kansas, and Texas. The voluminous eruption of magma lead to the collapse of the roof of the magma chamber along ring faults, forming two coincident calderas, the Toledo caldera (1.6 Ma) and the Valles caldera (1.2 Ma), that are of nearly equal size. The youngest of these calderas (Valles) forms a pronounced circular depression that is visible on images from space. View of the Jemez Mountains, Sierra Nacimiento, and the Valles caldera from the southwest (larger image available). After the collapse of the Valles caldera, subsequent magmatic activity in the underlying chamber caused uplift of the caldera floor and formation of a central resurgent dome. Eruption of viscous rhyolite lava along the caldera ring-fault system accompanied resurgence, resulting in extrusion of an arcuate ring of lava domes around the central resurgent uplift (Redondo Peak). Although there have not been any major eruptions from the Jemez Mountains volcanic field for the last million years, there have been a number of smaller eruptions, the most recent of which occurred about 50,000 to 60,000 years ago . Volcanic and hydrothermal evolution of Valles caldera and Jemez volcanic field, by F. Goff, et. al. in Memior 46: Field excursions to volcanic terranes in the western United States, Volume I: Southern Rocky Mountain region, edited by C. E. Chapin and J. Zidek, 1989, x + 486 pp. New Mexico Geological Society Guidebook 47: Jemez Mountains Region, 1996, F. Goff, B. S. Kues, M. A. Rogers, L. S. McFadden and J. N. Gardner, eds., 484 p.
New Mexico Geological Society Guidebook 58: Geology of the Jemez Region II, 2007, B.S. Kues, S.A. Kelley, V.W. Lueth, eds., 499 p.
Yes, Capulin is an example of a cinder cone. Capulin Volcano erupted 56,000 ± 8000 years ago (Stroud, 1997). More information about Capulin volcano is at the website for Capulin Volcano National Monument. Kilbourne Hole is an excellent example of a special volcanic feature called a maar. Maars are volcanic craters formed by shallow explosive eruptions caused by the vaporization of groundwater when magma interacts with water-saturated rocks. Kilbourne Hole formed when the Afton basalt interacted with wet rift-fill sediments in the Camp Rice Formation of the Santa Fe Group. Kilbourne Hole is about 180,000 years old. Kilbourne Hole is well know as a source of gem grade peridot, as well as olivine-rich (peridotite) and middle-crustal granulite xenoliths. The age of lava flows can be determined using a variety of techniques, but four common ways include examination of surface features, carbon 14 dating, 40Ar/39Ar dating, and 36Cl surface exposure dating. Three of these four methods rely on "radioactive clocks," where an unstable element decays to a stable element over time. 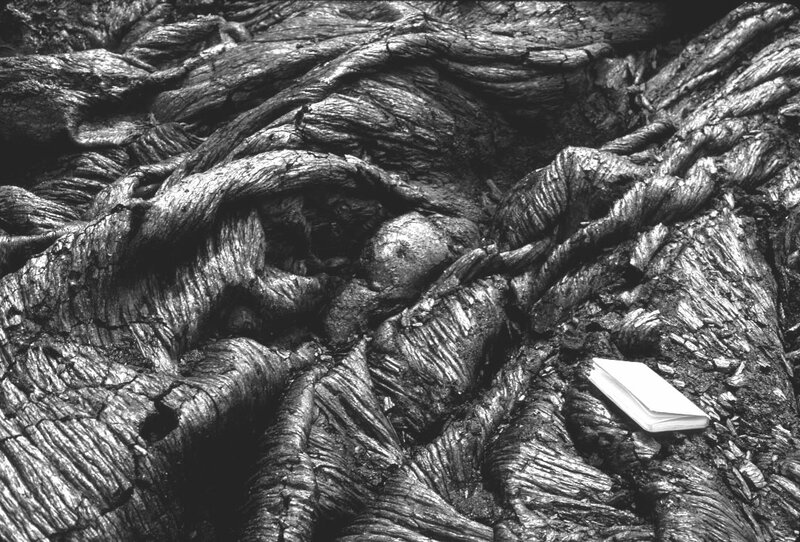 Surface features—the relative age of a lava flow, particularly basalt flows, can be determined by examining features preserved on the surface of the flow. Fresh pahoehoe flows have a ropey, glassy surface. As time goes by, the glass will degrade, but the ropey features will still be present. Eventually the ropey features erode away, leaving a flatter, smoother surface on the top of a flow. 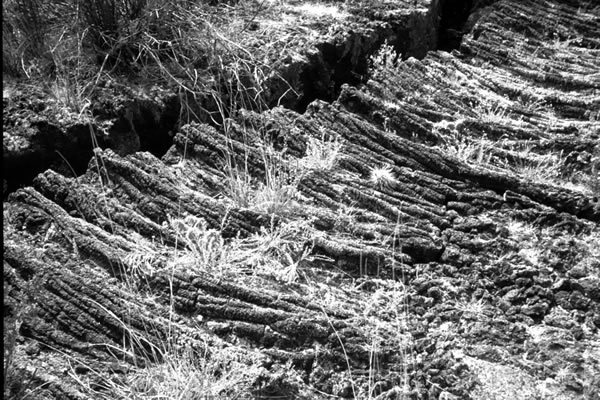 Carbon 14—Lava flows commonly bury plants and trees, turning them into charcoal. The charcoal can be dated using the carbon-14 technique, as long as the charcoal is less than 60,000 years old. Cosmic rays commonly collide with atoms in the atmosphere, creating neutrons that often run into with nitrogen atoms in the air. The collision causes nitrogen (14N) to become carbon 14C and one hydrogen atom. 14C is radioactive and decays to 12C, with a half-life of about 5,700 years. When a tree dies, the plant no longer produces carbon. 14C in the plant is no longer replaced by respiration, so the 14C amount starts to decreasedue to radioactive decay upon death of the tree. The 14C/12C ratio decreases through time because the amount of 14C decreases with a half-life 5,700 years and the amount of 12C remains constant. By measuring the 12C/14C ratio and comparing the measured ratio to ratios in living organisms today, the age of the charcoal can be determined. 40Ar/39Ar geochronology—Argon gas (40Ar) forms as a by-product of the radioactive decay of potassium (40K), so potassium-bearing minerals that are common in igneous rocks, such as sanidine, biotite, and hornblende, have been routinely been dated using potassium-argon geochronology. The calculation of an age depends on the measurement of the potassium (parent isotope)/argon (daughter product) ratio; as time goes by more potassium decays to argon and the ratio decreases through time. In the K/Ar method the amount of potassium is measured from one portion of a sample and the amount of Ar is measured using a separate split of the sample. Practitioners of this technique eventually realized that the amount of parent potassium in a mineral could be determined by measuring the amount of 39Ar produced by decay of 39K during neutron bombardment of mineral grains in a nuclear reactor, thus allowing the parent and daughter ratios to be determined from the same mineral grain. This improved measurement system led to greater precision and allows small samples to be analyzed. The 40Ar/39Ar technique is discussed in detail on the New Mexico Geochronologic Laboratory website. Cosmogenic 36Cl surface exposure age determination—this method is based on the observation that 36Cl is dominantly produced by cosmic ray reactions near the surface of the earth, primarily in the upper meter of exposed rock. The longer the rock is exposed at the surface, the more 36Cl will accumulate in a rock. Production of 36Cl in the deeper subsurface is small by comparison. The cosmic ray reactions that produce 36Cl include spallation of 39K and 40Ca, and thermal neutron activation of 35Cl. Cosmic rays are attenuated by interaction with earth's magnetosphere and atmosphere, so the production of 36Cl is dependent on the latitude and elevation of the sample. Cosmic rays are also attenuated by any material overlying the dated surface, such as windblown sand or snow, to to determine an accurate age, either the surface must have remained bare or the cover history must be known (Dunbar and Phillips, 2004). The lava flow east of Grants, New Mexico, which can easily be seen while driving on Interstate 40, is the product of the youngest volcanic eruption in New Mexico. This flow, known as the McCartys lava flow, has been dated at 3,800±1,200 years (Dunbar and Phillips, 2004). The youngest flow at Carrizozo Malpais is the Malpais lava flow, dated at 5,200 ± 700 years. No clear relationship between faulting and volcanic eruptions has been established. Many volcanoes form in areas with no faulting and most faults are not filled with igneous intrusions. In some cases, igneous rocks in the form of dikes do follow fault planes, but the igneous rock appears to be taking advantage of this path of pre-existing weakness. Also, in many volcanic fields, volcanic vents may be aligned along zones of crustal weakness (e.g., Chain of Craters in the Zuni-Bandera volcanic field), taking advantage of pre-existing flaws in the Earth's crust. Rarely, large magnitude earthquakes along major fault zones appear to trigger volcanic activity in nearby volcanoes. This answer was taken from Volcano World. Prior to an eruption, magma (molten rock) migrates into a magma chamber, or reservoir, beneath a volcano. As magma moves toward the surface, it (1) releases gases such as sulfur dioxide and carbon dioxide, (2) produces small earthquakes, and (3) causes subtle swelling of the flanks of the volcano. Scientists can watch for these warning signs by monitoring gases emitted by the volcano, determining the size and frequency of small earthquakes under the volcano by using seismographs, and measuring changes on the slopes of the volcano using tiltmeters. There have been more than 700 volcanic eruptions in New Mexico in the last 5 million years . The eruptive styles range from dangerously explosive to passive. Based on the past occurrence of volcanism, Limburg (1990) estimates that there is roughly a 1% chance that some type of volcanic eruption could occur somewhere in New Mexico in the next 100 years, and a 10% chance that an eruption will occur in the next 1,000 years. Limburg, E., 1990, Recent and potential volcanism of New Mexico: Unpublished MS thesis, New Mexico Institute of Mining and Technology, 149 pp. Sulfur-rich volcanic eruptions that eject material into the stratosphere can have significant effects upon climate. These effects generally consist of tropospheric cooling and stratospheric warming. The troposphere is the lowest level of the earth's atmosphere, ranging from the Earth's surface up to about 10–13 km, while the stratosphere is the part of the atmosphere between 13 and 50 km above the Earth's surface. Volcanic aerosols have a lifetime of 1–3 yrs, so tropospheric cooling will occur over this time frame. The eruption of Mt. Pinatubo volcano in the Philippines in 1991 caused a short-term global cooling of 0.5°C. Volcanic aerosols injected into the stratosphere can provide surfaces for ozone-destroying reactions. Therefore, large, sulfur-rich eruptions (e.g. Mount Pinatubo ) may result in decreased ozone concentration. Abundance of ozone may affect ultraviolet and longwave radiative fluxes, although no clear relationship between ozone abundance and global temperature has been established. Over the course of millions of years, large volumes of volcanic ash deposited in oceans can provide iron to seawater. This iron can promote biotic activity to remove CO2 from the oceans, and hence from the atmosphere, resulting in global cooling. Over the course of weeks to years, ongoing production of ash from volcanoes may locally change climate by modifying the “dustiness” of the local atmosphere. Recent work suggests that large eruptions may trigger El Nino climate events. However, Quaternary eruptions in New Mexico are unlikely to have had significant climatic affects because the eruptions either (1) may have emitted sulfur, but were of low volume and explosivity (mostly basaltic eruptions); or (2) were of high volume and explosivity, such as the Bandelier Tuff, but didn't contain sulfur in the magma and hence didn’t emit sulfur during the eruption.